There is an old saying that the “service to others is the rent you pay for your room here on earth” and this is certainly true of Chris Paul and the Chris Paul Family Foundation. On Friday, December 9, the Brotherhood Crusade hosted its annual gala and honored the work of Los Angeles Clippers point guard Chris Paul and the Chris Paul Family Foundation. “The Change the World Through Giving” black tie event was held at the Beverly Hilton Hotel in Beverly Hills. The Brotherhood Crusade celebrated the extraordinary achievements of Paul and the Chris Paul Family Foundation for providing “impactful resources” that have enriched and strengthened the healthy development of local communities in Los Angeles County said Danny Bakewell, Sr., Chairman of the Board, Brotherhood Crusade. “Whether its writing children’s books, serving as high school president for three years, owning a professional bowling team, appearing with his family on Family Feud, or simply bringing hope to the lives of others, Chris Paul changes the world through giving,” Bakewell said. Over 600 dinner guests were treated to entertainment provided by R&B sensation Anthony Hamilton and the Hamiltones. KTLA’s Chris Schauble and 94.7 The Wave Pat Prescott expertly guided the evening, serving as Mistress and Master of Ceremonies. Guests were encouraged to donate and bid on Chris Paul basketball items to raise funds for programs that have enriched the lives of Brotherhood Crusade youths. Because of the work of the Foundation, the youth of the Brotherhood Crusade enjoy a State of the Art computer lab. Low-income youth from South Los Angeles experienced a holiday takeover shopping trip compliments of Paul and comedian Kevin Hart. One hundred kids were given holiday gift cards with one stipulation: that they could buy anything they wanted as long as the first purchase was for someone else. 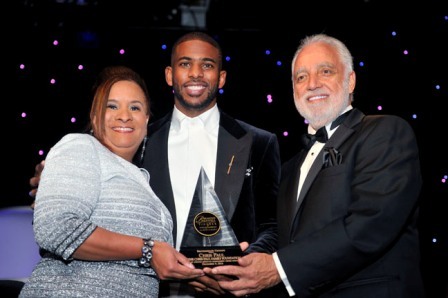 The Chris Paul Family Foundation known for its commitment to closing the gap and educating deserving students in Paul’s eyes is the real force to be reckoned with. A philanthropic organization, eleven years and counting, awards two endowed scholarships annually (one athletic and one academic) in honor of his grandfather at Wake Forest University. A family affair, the Chris Paul Family Foundation includes his mother and father, brother and sister-in-law, as well as his wife Jada who hosts a yearly Prom Dress Giveaway for high school Seniors. Recognized as a leader in the area of philanthropy, the Chris Paul Family Foundation enjoys partnerships with organizations who seek to impact communities nationally and globally. Paul resides in the Los Angeles area with his college sweetheart and wife Jada, and their two children, Camryn and Chris Jr. “Basketball is what I do, it’s not who I am.” “Family is the most important thing to me and we roll deep.” For more information on the Chris Paul Family Foundation, visit www.chrispaul3.com.